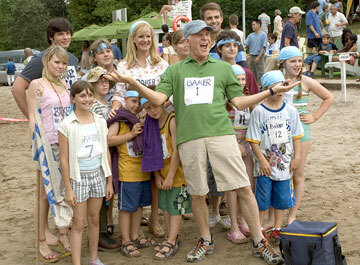 For anybody who wanted more of Cheaper by the Dozen there was Yours, Mine, and Ours. For anybody who still wanted more, now there's Cheaper by the Dozen 2. This sequel works on the premise that if people liked the first movie, it must have been because there were twelve children. So why not throw in a bunch more children so that people will like this movie even more! Well, it doesn't quite turn out that way. While this sequel, directed by Adam Shankman (The Pacifier, Bringing Down the House) and written by Sam Harper (Cheaper by the Dozen, Just Married) has a story that is more meaningful than the first, it is too scatterbrained to make any sort of difference. On an impressive note, all fourteen actors from the first film returned for the sequel. The first half of the movie resembles the first film, with lots of pointless slapstick. This will surely satisfy little children, but will bore most other people. The second half actually works on a sentimental note, but would work better if the lame comedy of the first was missing. The entire story is about a trip the Baker family takes to Lake Winnetka, Wisconsin. They used to vacation their years ago, and this may be their last chance to vacation as a family. Nora (Piper Perabo, The Cave, Cheaper by the Dozen) is pregnant and moving to Texas. Charlie (Tom Welling, The Fog, Cheaper by the Dozen) is in college, but yearns to do something different. Lorraine (a gaunt-looking Hilary Duff, The Perfect Man, Raise Your Voice) has an internship with Allure in New York. He doesn't realize it, but Tom Baker (Steve Martin, Shopgirl, Cheaper by the Dozen) is feeling very anxious about losing his family. Martin's comedy sometimes works and sometimes doesn't. When it doesn't, he tends to come off as shrill and annoying, and that's what happens here. Tom feels overprotective of his family, and this manifests itself in bizarre ways. He wants to do all sorts of cheesy things that he hopes will bond them together, while they want no such thing. All the while, his wife Kate (Bonnie Hunt, Loggerheads, Cheaper by the Dozen) just shakes her head and makes reassuring comments. Things at the lake take a turn when the Bakers reconnect with the Murtaughs, once their archrivals. Now, Jimmy Murtaugh (Eugene Levy, The Man, New York Minute) has his own brood, a huge house (while the Bakers rent an old run down one), boats, jet skis, video game systems, matching clothes, and a hot young wife (Carmen Electra, Dirty Love, Starsky & Hutch). This drives Tom bonkers, and he does all that he can to try to prove himself better than Jimmy (although nobody seems to care except for himself). Jimmy and Tom feed off each other, slowly making everybody miserable, especially Tom's tomboy daughter Sarah (Alyson Stoner, Garfield, Cheaper by the Dozen), who has a crush on Jimmy's son Eliot (Taylor Lautner, The Adventures of Shark Boy and Lavagirl in 3-D). Levy can also be hit or miss with his comedy, and it's a big miss here. Yes, he is plays somebody who looks cool, but is really a jealous kid, but the whole arrogant shtick does not work well for him. And everything feels too random. It's pretty frustrating because good scenes like the ones between Welling and Jaime King (Two for the Money, Pretty Persuasion) are mixed with bad ones like a barbeque ruined by errant fireworks. There's even mild T&A in the form of Electra, King, and even a wet t-shirt moment for Hunt, all of which seem very out of place. One really impressive aspect was that the script did not play the Electra character as a ditz. She is a genuinely likable person. While the sentimental aspects of the story are nice (and an improvement upon the original), it happens abruptly and feels out of place with the rest of the film. Tom and Jimmy are jealous of each other. Tom envies the material things that Jimmy has, but doesn't approve of the strict way he raises his children. Jimmy envies the togetherness of Tom's family, but doesn't like the apparent anarchy. It's freedom versus discipline and the kids band together to break up Rene Russo and Dennis Quaid, oh, wait, wrong movie. It takes a thoroughly contrived event to bring them all together for the required happy ending where they realize that they are not so different after all. Shankman does have a good moral, and the ending does manage to be heartfelt, but by throwing in random slapstick, he tries to have his cake, eat it, and shove it in people's faces. 1 hour, 40 minutes, Rated PG for some crude humor and mild language.